1) The ashes for Ash Wednesday normally are made from blessed palm branches from the previous Palm Sunday. The ashes are sprinkled with Holy Water and incensed before distribution. 2) The 40 days of Lent, which precedes Easter is based on two Biblical accounts: the 40 years of wilderness wandering by the Israelites and our Lord's 40 days in the wilderness at which point He was tempted by Satan. 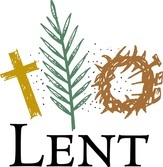 3) Lent officially ends on Holy Thursday. That is when the "Triduum", great three Days of holy Thursday, Good Friday and Holy Saturday occur leading to Easter. Easter is not only a day but an Octave (eight day) celebration leading to a Season of the Church, Easter Season, which ends on Pentecost. 4) The practices of Lent involves prayer, fasting and almsgiving. 5) Fasting requires that only one full meal be taken per day. Two other smaller meals may be taken during the day to maintain physical strength, but these two meals together should not equal a full meal in quantity. Fasting is an obligation for all those who have reached the age of 18 and continues until age 59. Those not specifically obliged to fast are encouraged to join in the discipline of fasting to the extent that they are able. 6) Abstinence prohibits individuals from eating meat on a particular day. Abstinence is an obligation for all those who have reached the age of 14 and continues throughout their entire life. Those not specifically obliged to abstain from eating meat are encouraged to join in this discipline to the extent that they are able. 7) Ash Wednesday and Good Friday are days of fast and abstinence. Fridays in Lent are days of abstinence. 8) Ash Wednesday and Good Friday are NOT Holy Days of Obligation!